In a skillet, sauté the sliced onions in olive oil. Roll out the pizza dough on a large piece of aluminum foil. Spread the sautéed onions onto the dough. Stir the fig preserve into the chèvre (the fruit is at bottom) and drop spoonfuls of cheese all over the dough. Slide the pizza and the foil onto a preheated pizza stone or cookie sheet and bake at 500° for around 10 minutes or until the crust is just turning golden brown. 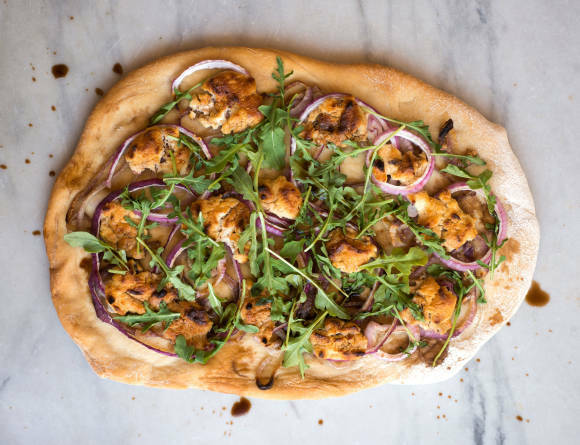 Remove pizza from oven, sprinkle arugula over the top, and return it to the oven to bake for about 5 more minutes. Drizzle balsamic vinegar over it before serving.